From time to time, it has been our pleasure to not only play and explore the classic games, but to discuss them with their creators. 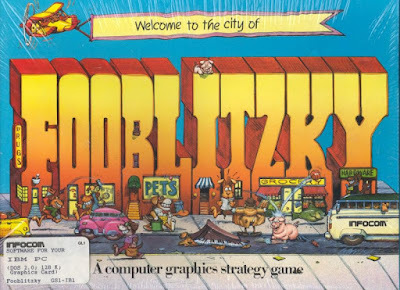 We’ve spoken to game designers and game illustrators, but I am pleased to have been able to spend some virtual time with someone who was both: Brian Cody, the co-creator of Fooblitzky, Infocom’s first and last computer board game. If you missed our coverage of that game, you can find it here. Brian was not only responsible for much of the game design, he also developed the game’s unique graphical style. The following interview has been assembled from a series of emails in January 2019 and edited together for your reading enjoyment. How you got your start at Infocom and what you had been doing prior to that? 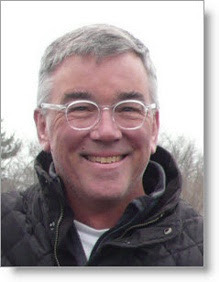 I came from a commercial art background, having graduated from Massachusetts College of Art in the mid-seventies, and worked in a variety of art-related jobs: freelance illustrator, TV cartoon animator and art director in children’s book publishing. My last position before joining Infocom was as staff graphic designer for Houghton Mifflin’s Children’s Book Division, a position I found very slow-moving and boring. I was anxious to try something different. Can you tell us more about the children’s books that you illustrated of cartoons that you worked on before Infocom? Trade books: those big colorful picture books you typically find in all children’s book department. Many successful star illustrators have emerged from this category and earn a good living. I was not one of them. 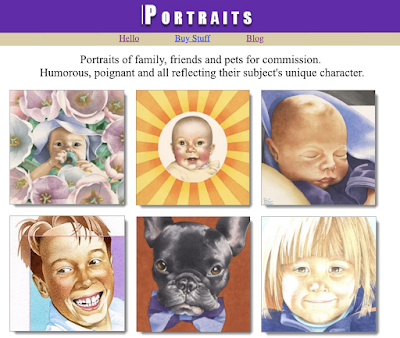 Educational publishing: huge publishing programs that produce 200-300-page textbooks for grades K-12 and, in the lower grades, are filled with fun, colorful, spot art. Textbook illustrators do not make big money. That was me. So, consequently, there are no trade books with my name on them. But if you had a grade school child in the late 70’s, 80’s, 90’s or early aughts then they undoubtedly experienced my work; you would have to dig through the back of the textbook to locate the paragraph, invariably set in 6-point mouse type, to find my name listed along with 25 other illustrators. 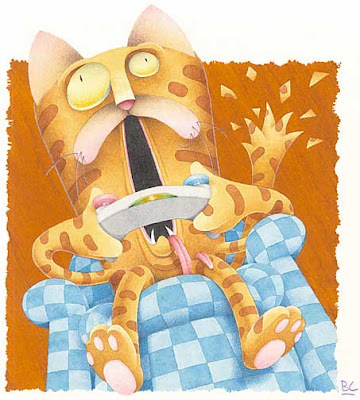 I did thousands of illustrations for all the major textbook publishers: Houghton Mifflin, Brown, Scholastic, Harcourt/Brace, etc. Just FYI, If you ever travel back in time and need to call Brian, he’s extension 61. As a child of the 80s, I no doubt saw some of your illustrations! Unfortunately, I didn't steal any textbooks to allow me to go back and check now. Can you tell us about the Infocom Graphics group, what was done when you arrived and what was not? How did it get started? There was never any Infocom Graphics Group per se. Infocom author and interactive text game-designer Mike Berlyn hired Dan Horn, an Atlanta-based, experienced computer gamer, and myself in late 1982 to design Infocom’s first graphics game. We were sort of like the company’s skunk works; nobody knew what we were doing, least of all us. Mike was our manager and his first assignment was for us to go play computer games for six months so that we could learn what an actual, re-playable game was. We met weekly to discuss learnings. At around the six-month mark Mike decided it was time for Dan and me to produce some graphical game concepts, most probably to justify our existence. How did development of Fooblitzky get started? So I had a direction. Using the same blue-lined graph paper we all used in fifth grade science class, I mocked up a crude gameboard showing sidewalks, stores and items to be collected. We rolled Monopoly dice and moved around the board, keeping rough notes on who bought what. It must’ve shown some potential as a multi-player, family-oriented computer board game, of which there were few on the market at the time. But it had to be more Infocom-weird. A “Koala Pad”, courtesy of Wikimedia commons. Uploaded by Nynexman4464. What happened next? How did the team come together? Up until that point in early 1983, I was producing near unintelligible computer graphics on a Koala pad with stylus and no printable output. Then Infocom management showed up with something called a “Macintosh”, a pre-release, 128K Apple prototype, intended for use in the development of future Infocom products. Mouse-driven, with both word processing and graphics programs, Mike recognized what it could be and soon appropriated it for my graphical use only. It did not take long to master both MacWord and MacPaint and I was soon producing graphics with supporting text for our weekly meetings, demonstrating what this computerized scavenger hunt might look and play like. 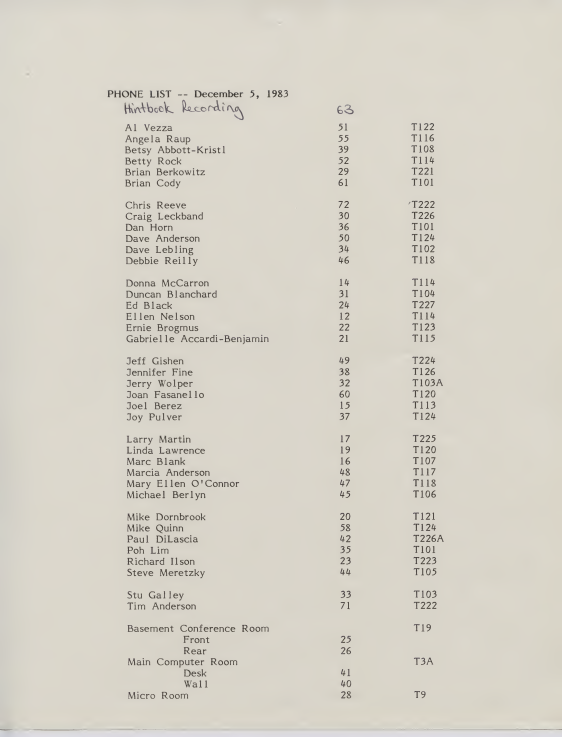 It was at this point that one of Infocom’s original founders, Marc Blank, began to occasionally join the graphics meetings, most probably at Mike’s urging. In the meantime, Mike began inviting a couple of different subject experts to our weekly graphics meetings. Poh C. Lim, an MIT graduate and software engineer at Infocom, was added to begin the conversion of my Macintosh graphics files into a format acceptable to Infocom’s proprietary, virtual ZIL-machine compiler. Poh soon became an almost full-time member of the still-informal graphics group, providing not only deep technical support but also many different game suggestions and improvements. Brian Moriarty, a former tech editor at ANALOG Computing and combination tech editor/game designer at Infocom, also joined the group for our weekly meetings; while his principal function seemed to be to remind us every week of how stupid we were to be designing a graphics game in an interactive text gaming company, Brian’s long background in computer gaming often proved invaluable in keeping the game’s design and implementation on track. If this is composed of reused tiles, I sure can’t tell. What was Poh Lim’s role on the development team? It was Poh who first understood and articulated the need to establish a limit on the graphics used to produce the scavenger hunt. Otherwise it would grow too large and slow for the mainframe-based ZIL graphical compiler to be able to digest and convert into Apple II, IBM PC and Atari-compatible software. If memory serves me, I was given 240 separate and distinct blocks (8x8 pixels? Not sure.) to use to illustrate, color and animate the entire game. For instance, a single black block could be used a thousand times to outline the four-quadrant gameboard, the multiple iterations of the animated dog, the 18 different store items, the Chanceman and so on and the compiler would still recognize and count all those things as being comprised of only a single, black block. To a degree, that explains the game’s blocky look and feel; the entire thing is built on a grid. As the game took further shape, mid-to-late 1983, and Poh was able to preview online the most basic functions using my Macintosh illustrations – gameboard, stores, spinning game wheel, animated items and animated dog, etc. – weekly graphics meeting became important in fleshing out the actual gameplay. I’d come up with the game’s concept and look/feel but the gameplay itself needed more fun, more randomness, maybe even some strategy. Which is where the addition of Marc and Brian to our group of Mike, Dan, Poh and myself became so valuable; the Chanceman, crosswalks, the falling piano, UGH, bumping, lockers, pawn shops and more elements of chance all came careening out of this collective group. 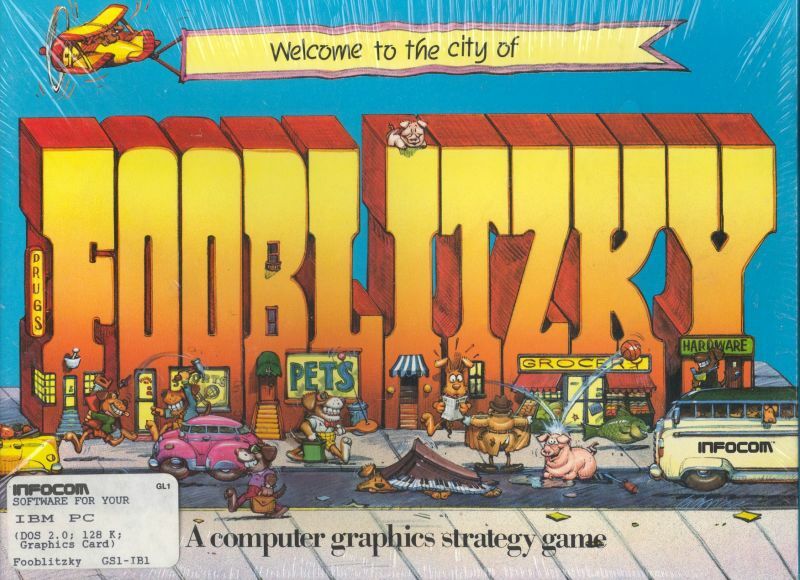 Marc came up with the name Fooble to describe the game’s coins and eventually named the game Fooblitzky. How did the development of Cornerstone affect what you were doing and how it was released? 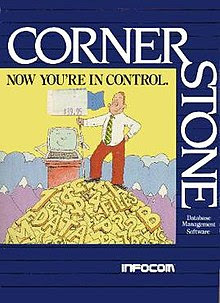 Other internal projects, including Infocom’s answer to Lotus Software’s groundbreaking 1-2-3 spreadsheet software, named Cornerstone, continued pulling at Mike’s time and he began to back out of the babysitting portion of managing Fooblitzky. Jon Palace was hired to project manage the graphics project as well as other ongoing interactive text projects. By this time, I knew what Fooblitzky was and I knew what was required, from a graphics POV, to finish it; just keep drawing. Jon joined our weekly graphics meetings and his scheduling discipline became important to helping keep development on track. 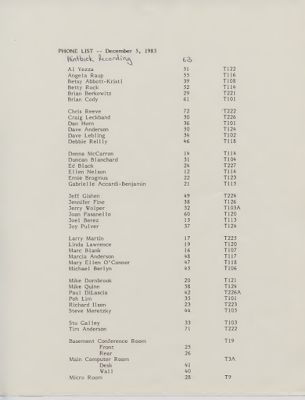 You’ve mentioned Mike Berlyn, Marc Blank, and Poh Lim, but there is a fourth person credited for Fooblitzky. How did Paula Maxwell come to join the team? In very early 1984, I was able to hire Paula Maxwell to help with the game’s animation. Her responsibility was to complete animations I’d begun, using a rough style guide for direction. Paula worked in the graphics group for about six months and then decided to return to her native California. By mid/late-1984 we had a fingers-crossed finish date for development of Fooblitzky of December 1984. I’d mocked-up a prototype of the game box and worksheets, shown them to Mike, Marc and the group and, with their approval released it to Carl Genatossio, Infocom’s Creative Director, for production. A rough cut of the game was in Testing for debugging and it had been previewed with Public Relations and the senior interactive writer’s group. “Doubtful” was the word I think best described their puzzled reaction. In late 1984 I was unexpectedly laid off. Graphical work on Fooblitzky stopped. That is unexpected! Do you know how the game was finished? In 1985, I was hired back as an independent contractor to finish the remaining Fooblitzky graphics and animations. January and February are what it took I believe. Mike had, at that point I think, left the company. The launch of Fooblitzky was strange-- mail order-only for the first six month. Leaked sales records suggest it may have sold only sold 500 copies that way. (It sold more later.) Do you know anything else about the release? I had no input into the game’s production, release, and distribution. It would not strike me as silly to find that Carl had 500 boxes printed and management put minimum effort into trying to sell them in order to clear warehouse shelf space. I later heard anecdotally through Infocom friends that the development of Cornerstone had far outgrown anyone’s estimate for time, budget, and headcount required to finish. And that all non-mission-critical internal projects had to end in order to get Cornerstone out the door. Just company gossip. I returned to my core expertise in late 1985, what was once called “commercial art”. I held a variety of positions involving illustration, graphic design and art direction. Eventually I moved into management, spending 10 years at Digital Equipment and culminating in five years as Director of Marketing Services at relational database manufacturer Sybase, then one of the 10 largest software manufacturers in the U.S. I am fortunate to have a wonderful 43-year marriage to my wife Joel. We have 2 great kids and are starstruck daily by our four granddaughters, two of whom live in Seattle and two locally in Ipswich; the latter pair I fruitlessly attempt to provide daycare for. Fooblitzky was a breeze compared to these two. This is amazing! Thank you for sharing your story. Brian really does find unique character in his art. I want to thank Brian for spending as much time as he did talking with us. Reading over our conversation for the first time was like turning on a light into an otherwise unknown portion of Infocom history. There is a lot here to digest, but it’s clear that Brian had a much larger role in the development of the game than is popularly understood. Perhaps we can have a follow-up interview with Mike Berlyn in a few months, if he is interested, especially as we have now played all of his adventure games except 1997’s Zork: The Undiscovered Underground. You can find (and purchase!) Brian’s work at his website, BrianCody.com as well as his Zazzle store. Up next for me will be Dave Lebling’s Spellbreaker, our last Infocom game of 1985. That should be a lot of fun. I'm not quite clear from the interview: did he do the cover image for Cornerstone? Because if so, it seems like maybe not the best context for his artistic style. I don't think so, but I could ask him. I was illustrating the fact that he was talking about Cornerstone, not that he designed that box in specific. Sorry for any confusion. Hey. I had a Koalapad for my C64. I think it was supposed to be so easy to create art with it that anyone could do it. My few attempts at drawimg things proved the advertising wrong. I remember making some pretty cool mirror/kaleidoscope-effect things with it on my C64.